For eyes that shimmer with the summer sun. Maritime mood 5 eye shades. ･A five color set with four-color easy-to-use "gradient colors", and one highlight to let you create designs that pop like ribboning effects. Three maritime colors with a limited edition color for color that stands out like a glistening shell in the sand. ･A blend of emollient ingredients and elastic powder wrapped up in rich essential oils. Velvety light and superbly smooth that feels great on your skin and leaves a uniform finish that feels like a perfect fit. ･High pigment formulation for a translucent look. Creates clear beautiful eye color. Semi-matt texture that goes great with any makeup. ･Two double ended chips make gradated design application easy. Create beautiful eye finish using the large chip for the bottom of the eye, medium chip for nuanced coloring, and small chip for color shading and ribboning. ･The top compact has the key colors of navy blue, white and pinkish red to express a romantic maritime mood with this limited edition. 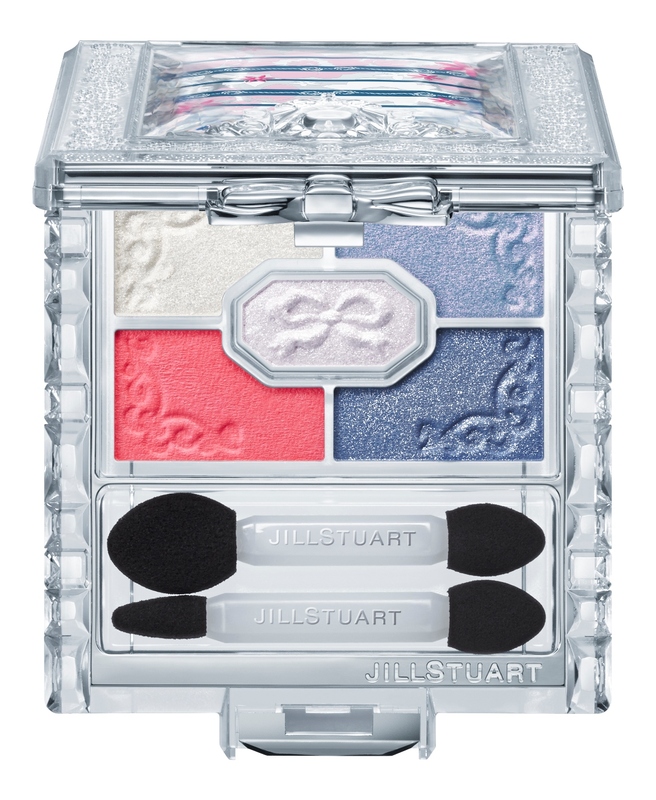 Jill Stuart's original marine world view represented with the keynote border and rope motif enhanced with the pink floral pattern. ･Continuous smooth texture and highly translucent color of the essence-in base. ･The A "eye base" with the finger tips or chip. Next apply the B and/or C "nuance color" around the eye. Apply the D "shading color" for detailing, completing the process with the E "ribbon color" where you want to add a glamorous finish.